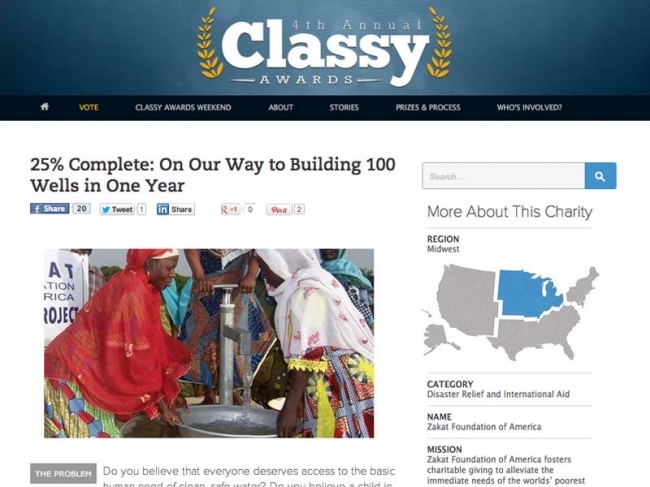 Zakat Foundation of America (ZF) has been selected as a Top 5 Finalist in Disaster Relief and International Aid for the 4th Annual CLASSY Awards. From a pool of 2,400 nominations, our Achievement Story stood out as one of the best – we’re extremely excited about it! You can help us win by voting for ZF as your favorite candidate in the Midwest. <a href=”http://www.stayclassy.org/classy-awards/vote”>Visit the CLASSY Awards website to vote</a> Voting ends at 11:59 P.M. PST on July 26, 2012.